When people think of TLC, they often think of shows about people living in piles of their own filth or parents living vicariously through their children-and recently, the network decided to produce a show about Irish dance, set to air sometime in the next few months. Seeing as there was notable Internet backlash on the series out of fear that it would be a second “Toddlers and Tiaras”, we decided to see what Irish dance is all about, according to the people involved in it. 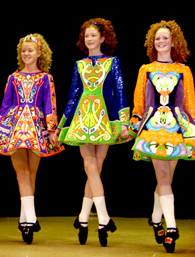 Irish dance is a phenomenon that caught worldwide attention from shows such as “Riverdance” and “Lord of the Dance”, and continues to thrive today. Children and adults of all ages enjoy Irish dancing, and often do so competitively at a gathering called a feis (pronounced “fesh”). “My favorite part of going to a feis is dancing and having fun,” said Haley, a dancer for The Academy, an Irish dance school with locations in Columbus and Cleveland. Haley is a decorated dancer, having danced for four years and placed at regional competitions in the Midwest, and seemed confident in the moments before competing. Megan, a younger dancer for The Academy, seemed to agree. When asked about her favorite part of a competition, she shyly answered, “Dancing.” Megan went on to win all three of the dances she participated in that day, while Haley either won or placed in the top three for every dance she entered. Upon arrival, dancers have to get ready and make sure they present themselves well in front of the judges-for girls, usually an ordeal involving curly wigs and elaborate dresses. However, if a girl isn’t using a wig, she’ll often spend the night before with curlers in her hair, as was the case with a dancer named Sarah. “She hates the wig, so we’re trying this today,” said Sarah’s mother, who was styling her daughter’s hair into tight curls while they were being interviewed. While appearances do play a part in Irish dance, it seems to take a backseat to the talent and dedication involved in learning steps. Rules state that there are certain things dancers can and cannot wear depending on their level of experience-Haley being the exception, all of the children who were interviewed were wearing dance school uniforms as a part of dressing their “Sunday best”. Based on press releases from TLC, the reactions to the new series have been mixed at best. While the show’s focus, be it on drama or the actual dancing, is to be determined, the Irish dance community can only hope that they aren’t portrayed in the same light as those of “Toddlers and Tiaras” or “Dance Moms”.